“We complicate to understand, and simplify to act”. So says Geoff Mulgan in his new book, Big Mind. This sentiment chimes a chord with the way we work at 100%Open, where we are always striving for insightful brevity. The book is a wide ranging and fascinating overview of collective intelligence research and practice. And it demonstrates how most groups are not at all intelligent. Rather they often suffer from group think instead of enabling the true sharing and combining of ideas. If left to self-organise, most face-to-face meetings suffer from the Paereto principal in that 20% of the people do 80% of the talking. The first person to speak, often the most senior person, tends to dominate the conversation that follows. And online conversations are generally even more uneven as they tend to follow the 1/9/90 rule. 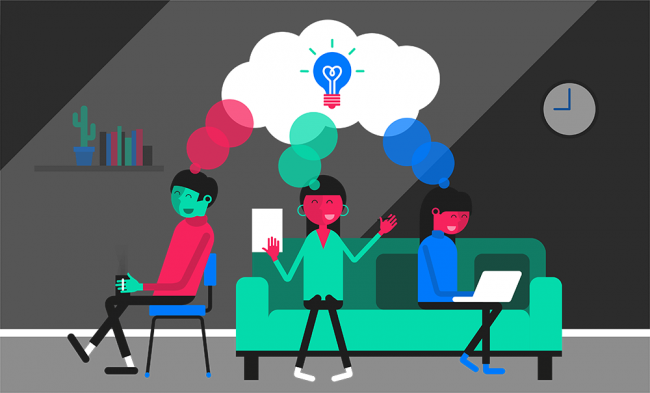 One way that we have learned (from the likes of Google Ventures via some work we did recently with Grant Thornton) that helps groups to ‘work alone together’, is silent brainstorming. This works by asking everybody in a group the same question and ensuring that they answer it on their own at first. Only once everybody has had a chance to respond, usually in writing, does the group take it in turns to share their responses. That way you can easily identify any areas of agreement and then focus on discussing novel ideas or areas of disagreement, which is a much more fruitful. In addition, I learned years ago from Johnnie Moore that any meeting of more than 5 or 6 people quickly turns into a series of monologues instead of a genuine conversation, so it’s always advisable to split into sub-groups quickly as the amount of work done is inversely proportional to the number of people participating. In summary the essence of smart groups is to ensure equal and honest participation and to engineer independence between perspectives as best as possible. Namely to work alone so that you can collaborate better together. Note: If you want any pointers how to boost your collaboration quotient, or the collaboration preferences of your team, then you might be interested to try the 100%Open Co-Lab test.